Researchers at Lawrence Livermore National Laboratory (LLNL) have found that soldiers using military helmets one size larger and with thicker pads could reduce the severity of traumatic brain injury (TBI) from blunt and ballistic impacts. This would be a low-cost solution/improvement on current technology. The study did indicate that no material tested outperformed the current padding in the Advanced Combat Helmet (ACH); they looked at old military padding, two types of padding in NFL helmets and “padding used in other protective equipment”. This is a good place to start in regards to a cost-effective way of improving helmet technology in football and other collision sports. This information even gives credence to the GelCool System we highlighted a month ago. We must also remember that being hit in the head is not the only way one can sustain a concussion. 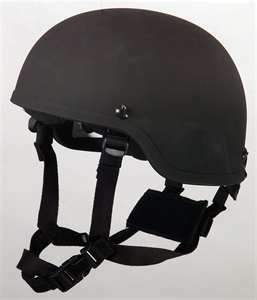 Although the padding would help mitigate impacts/blasts to the head, they would do little for the rotational and whiplash injuries that translate into concussive episodes. Every bit does help. Thanks to Matt Chaney for the heads up on this article. Chin strap designs are also a problem, Natick Labs Army researchers have identified the corrective mouth guard used by the Patriots and developed for boxers. as a means of reducing the risk of mtbi. The spaghetti strap used in prior helmets was cutting larynx during blasts and the football chin strap was the next best thing. Anchoring to the chin was the logical evolution, given its use in sport. Changing that will be like moving a glacier in terms of military R & D, we have been dealing with the red tape for about four years. Change is not something that is welcome, besides, chin related mtbi is the most misunderstood element of concussion, thanks to NFL helmet centric research. They have awarded a grant to examine a customized mandular orthotic, based on the linked preliminary research. Others should also conduct their own independent study of this hypothesis.